Acquired directly from the artist by Harry Torczyner in 1961. B. Nol, Magritte, Paris, 1976, p. 70 (illustrated). H. Torczyner, Ren Magritte: signes et images, Paris, 1977, p. 59, no. 78 (illustrated). Letter from R. Magritte to H. Torczyner, 6 February 1962, in H. Torczyner, L'ami Magritte: correspondance et souvenirs, Antwerp, 1992, no. 221. H. Torczyner, L'ami Magritte: correspondance et souvenirs, Antwerp, 1992, p. 185, no. 22 (illustrated, pp. 40 and 206). R. Magritte, Magritte/Torczyner: Letters Between Friends, New York, 1994, p. 69 (illustrated). D. Sylvester, S. Whitfield and M. Raeburn, Ren Magritte, Catalogue Raisonn, London, 1994, vol. IV (Gouaches, Temperas, Watercolours and Papiers Colls 1918-1967), p. 310, no. 1634 (illustrated). Minneapolis, Walker Art Center, The Vision of Ren Magritte, September-October 1962, no. 90. Torczyner acquired this collage and Le savoir (lot ???) from Magritte in May 1961. 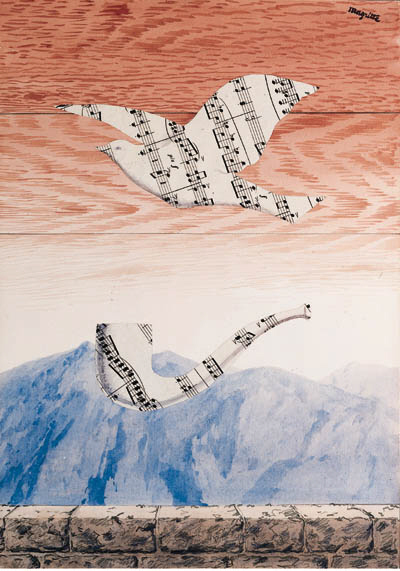 However, it appears that the collage was not titled until almost a year later when, in a letter to Torczyner of 6 February 1962, the artist wrote, "I think the title Moments musicaux fits the collage with the pipe and the bird. This title could be applied to several works (like certain other titles such as L'art de la conversation, Stimulation objective, etc.)... (quoted in D. Sylvester et al., op. cit., p. 310). In Moments musicaux, Magritte, as so often, jars the viewer's expectations. The lower half of the composition appears at first to be fairly conventional: the eye moves into the distance, from the stone wall back towards the realistically rendered mountains and the misty sky behind them. Yet the sky is quickly transformed into the trompe l'oeil of the grainy wooden planks of the upper half of the composition, flattening the picture plane and thereby undercutting the sense of distance established in the lower portion. Further confounding the sense of space and illusion are the collaged paper elements, signifying a bird and a pipe, whose presence is mysterious and illogical.